I love to quilt, but it’s a rare event that I actually make a whole quilt complete with binding. Rather, I like making quilted stuff: Things that involve quilting that I can incorporate into an item, like a purse, or a Patchfolio. 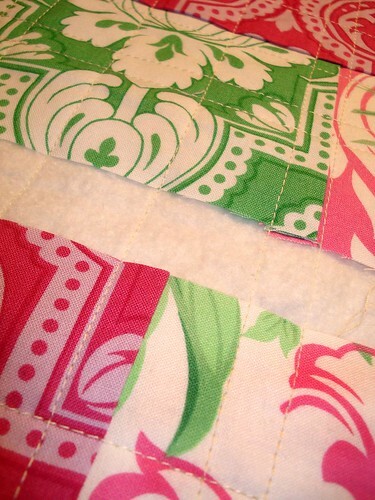 Small panels are SO much easier to quilt – no sweating or tachycardia involved. I only JUST discovered that I can save a lot of time by quilting several panels at the same time. I’ve done up to 3 Mini Patchfolio covers at the same time. Less turning around time = less overall quilting time. This works great, especially if you are just quilting with straight lines. I laid the panels out on the batting, then pinned them in place. Then, I cut the batting slightly larger than the pieces and started quilting. When I was sewing across the length of the panels, I just kept sewing over the batting until I was sewing up onto the other panel. I use Warm ‘n Natural batting for all my quilting projects. I’m not sure if this method would work if you were using thin polyester batting because it isn’t as dense. Oh your so clever ! What a great tip! Thanks for sharing it! That is an awesome idea. What a timesaver! Thanks for sharing a super idea. Beautiful fabric combinations you have. They will be lovely finished projects! This is very clever. Thank you for sharing the idea. I bought the pattern a few months ago and am hoping to actually make a couple this week. I just may use this clever idea you shared. That is just about the smartest thing ever! Now can you help me get over my fear of actually quilting my first quilt? Such a time saver too! Love the idea, thanks for sharing as usual. I must try some quilting of small items too. now that makes sense…LOL! Think I’ll try that! I just wanted to drop you a line and let you know that I’ve added Craft Apple to my list of kindred spirit blogs at http://curlytopbop.blogspot.com/. Excellent idea! I love tips like this that save time and thread and turning, etc. I am in love with those fabrics. Fantastic idea and beautiful fabrics to drool over! Thanks so much for the tip, it will be very helpful in the future, i’m sure! 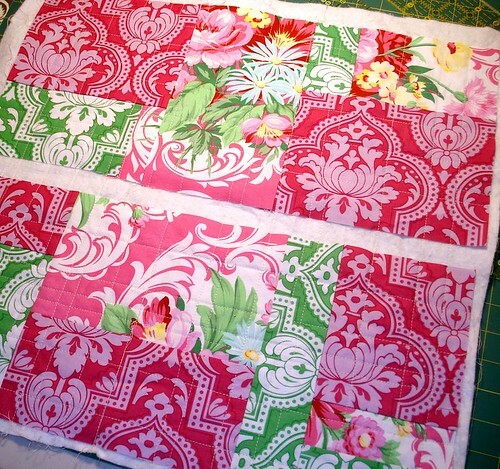 Beautiful quilt as well, i like the color pattern. Wow, what a great idea! And your pictures are so lovely and bright. This is such a great tip! Too bad I didn’t think of it before all of the quilting sessions I’ve gone through. I’m so excited to quilt something now! I love your blog! It was actually one of the first blogs I started reading. I was tagged by Cookie to play a game and answer questions. I was asked to choose four people and tag them. I have chosen you as one of my four. If you would like to play, please go to my blog and pick up the questions, then post your answers on your blog and tag four more people. Love your blog~keep up the great work. Marvellous tip – thank you! Why did I not think of that…so simple and quick. Hello to everyone!! I am in Australia, visited the states 2 yrs ago , we drove across from LA to PA and saw so much of your beautiful country, everyone was so nice to us. We are coming back after our daughters wedding in September..soooo looking forward to that! !